Ping Su, a 27-year-old Chinese woman, has been living in Slovenia for several years. 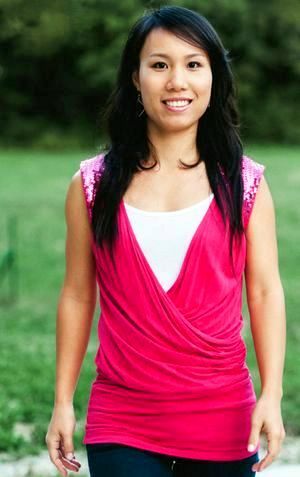 Ping Su came to Slovenia driven by love to Matjaž, her husband, with whom they have been together for more than five years. The first thing people usually notice about Ping Su is her amazing smile and a well-cared-for appearance. A she says proudly, Chinese women pay much attention to their appearance. In addition, people are completely charmed with her excellent knowledge of the Slovenian language. Immediately after the wedding, she moved to Slovenia and enrolled in the Slovenian language courses at the Philosophical Faculty of the University of Ljubljana. Later, she twice re-attended the courses in order to adapt quickly to the realities of Slovenia, the country in which she created a family, made new friends and started her own business. Ping Su comes from a Chinese coastal town Beihai, the climate of which is quite different from the Slovenian climate. The weather is constantly hot and humid. Therefore, the working day there is somewhat reduced: from 8:00 a.m. to 12:00 noon and then from 3:00 p.m. to 6:00 p.m. With a typically feminine vanity, Ping complains that local women have many problems with the skin contamination. “I like Slovenia and its climate very much. Here, my skin looks nicer and cleaner,” Ping Su says smiling broadly. Not surprisingly, our conversation soon turned to the topic of beauty and skin care. Ping Su notes that she has completed a course in massage and make-up. However, in China she received a degree in “German” (“That’s a pity that I made too little use of this language at home, since there were no opportunities for practicing it,” she says). 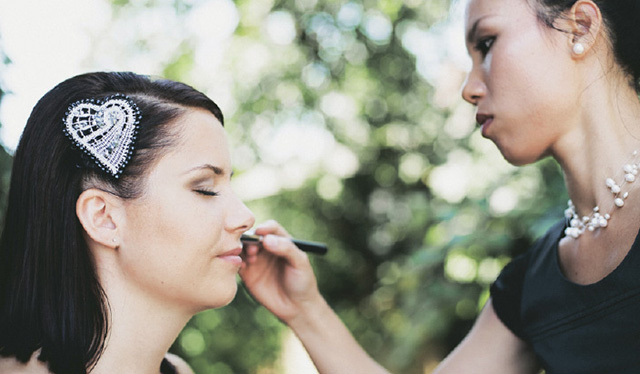 In Slovenia, she is mainly engaged in make-up. In Ihan, where she and her husband own a house, Ping Su has opened the “Ladies Area” (“Kotiček za dame” in Slovenian) — a cosy beauty salon specially created for those who want to be pampered in a pleasant home environment. Ping is known as a master in depilation, which she performs slowly and virtually painless, as well as the facial massage techniques, among which the lifting massage stands out and is loved by many of her clients. Ping Su performing a make-up. Make-up is one of the things that Ping Su enjoys with great pleasure and self-forgetfulness in the “Ladies Area”. Along with cosmetology, Ping Su would gladly work as a translator. However, these could only be dreams so far, in particular, because of her small children. 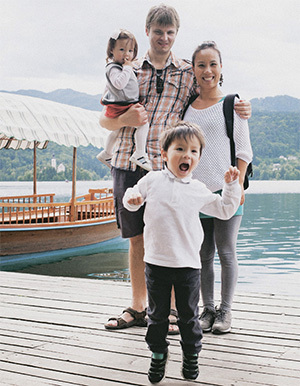 The young Chinese woman with her Slovenian husband admires mountains and other natural attractions of Slovenia, so she and her family love to travel to different parts of Slovenia. This photo was taken during a trip to the Bled Lake. In China, she received a degree in “Applied German Language”, which is a field of study where a foreign language is taught on the level high enough to use it in any area of ​​business, to organise guided tours, provide translation services, perform language teaching, and in other spheres of life. The passion for foreign languages ​​brought Ping Su to her future husband Matjaž Gregorič, a successful programmer. At that time, he was studying the Chinese language and looking for people to communicate with in Chinese. In one of the Chinese Internet forums, he met Ping Su. As a citizen of Slovenia, he was not able to register on that site, so he registered as a German, because he knew German well. That is how he got acquainted with Ping Su, a young student philologist, who agreed to make friends with him because she wanted to communicate at the forum with someone who spoke the language she was studying. A spark of love flashed immediately between them and after only a week of chatting in a program similar to Skype (once they spent nearly 12 hours communicating without a break! ), they decided to get married. The Chinese and the Slovenian families in one photo A collective photo from the wedding of Ping Su and Matjaž, when the relatives and friends from China and Slovenia came together. 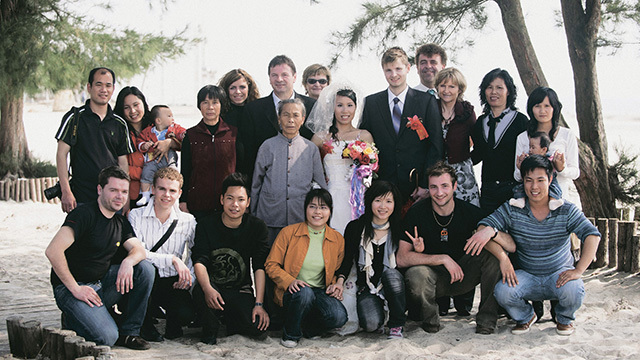 In the summer of 2008, Matjaž came to China, and a few weeks later, the young people formalized their relationship in the local civil registry office. One year later, they got married. The wedding was held according to the local customs and was attended by Matjaž’s parents and some of his relatives and friends. After the wedding, Ping Su flew to Slovenia, where she has been living for more than four years already. She is so used to living in Slovenia that she cannot even imagine a possible return to China. After the wedding, she and her husband decided that each year Ping Su would visit her family. However, a trip to China with two children is an extremely tedious affair. This year, four of them visited the hometown of Ping Su. She remembers that it took her children a while to get used to the local food, climate and language. Ping Su was very happy meeting her relatives who had not visited her in Slovenia. In China, it is a very troublesome and costly process to get a visa to travel abroad. Ping Su says that the current state of the economy in China is far from rosy. Once the inhabitants of her native town used to be more open-minded. However, today all of them are more concerned about their own life and income, so the Ping Su’s family has not yet seen her new home. Meanwhile, Ping Su does not suffer from an excessive nostalgia for her homeland. She is very independent and can take care of herself. In addition, the husband’s family accepted her so openly and cordially that in Ihan she feels at home. Her mother-in-law Helena and father-in-law Marjan look after the children when she works with clients, and their great-grandmother Ivanka enjoys playing with her beloved great-grandson. Children know two languages, both Slovenian and Chinese. Ping Su’s 18-month-old daughter Lina utters only a few words, but fully understands her mom. Ping Su is delighted with Slovenia! She notes that the Slovenes are very friendly to foreigners and all the people with whom she communicates are always happy to help her finding the right word. She adds critically that sometimes it is still difficult for her to choose words. “I would love to learn more new words, so I always ask locals how to name this or that thing,” she says with a smile. At the beginning of their family life, Ping Su communicated with her husband mostly in English and a little in German, but now they talk only in Slovenian. Slovenia immediately won her heart, though, being a foreigner, she enjoys far less privileges in work than the locals do. In this regard, she notes that the Slovenes are behaving quite tough. In Slovenia, there are several laws that strictly regulate the business activities of foreigners. Nevertheless, Ping Su is naturally an optimist. She believes that her business will grow gradually. Now she has to pay a lot of attention to children, and later the time for her career will come. A Good Attitude Is the Key to Success! She and her husband love to invite friends and relatives to their home. They treat their guests with Slovenian and Chinese dishes. Ping Su loves to cook rice, fried vegetables and chicken chopped into small pieces, but most of all they love her specialties, such as “jing jiang rou si”, which is roast pork with leek, and “jing shao qie zi”, which is fried eggplant in soya sauce. She loves Slovenian dishes as well, especially “Obara” (a stew cooked from various kinds of meat and internal organs), which her father-in-law cooks, as well as blood sausages with potatoes and sauerkraut cooked by her mother-in-law. Even without being a sweet tooth, Ping Su loves the apple pie cooked by her husband’s grandmother Ivanka. Ping Su’s name in Chinese means a type of local algae, and the easiest way to describe her surname is to use the verb “wake up”. Her life path is not strewn with roses, but because of her mood, confidence and charm, she can overcome any obstacles. Love has played a special role in her life. This was the feeling that brought Ping Su to the country on the sunny side of the Alps. This fact is felt in her attitude to husband and children, and in her attitude to the parents-in-law and all the people that are part of her new family. Therefore, Ping Su is simply happy in her new homeland!